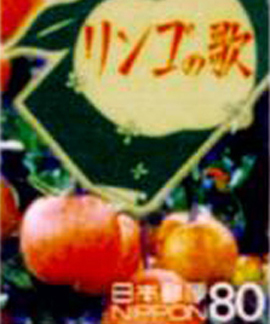 A Japanese stamp, part of the 20th Century Museum Series, commemorating the "Song of the Apple". .
Apples are not always the cause of discord between Japan and the United States. The image of bright red apples cheered up Japanese people with an immensely popular "Song of the Apple" in the years immediately after the war. Half a century later, this experience led volunteer groups to plant apple trees, appropriately named "Apple of Hope" in areas devastated by the Great Kobe Earthquake in 1995. The Japanese volunteers plan a similar planting campaign in New York City for the surviving families of the victims of the 9/11 terrorist attack. Apples thus have a long history of crossing the Pacific carrying a spirit of hope and goodwill.